Germany's invasion of Belgium, a neutral country, prompted Britain to declare war. The alliances between countries brought the Allied Forces: France, Britain, and Russia together against the Central Powers of Germany and Austria-Hungary. 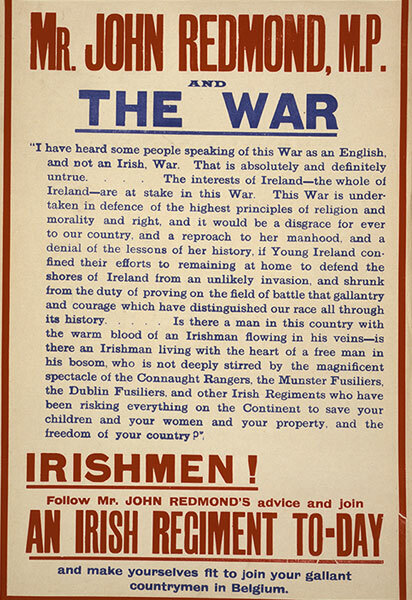 John Redmond urged Irish Volunteers to enlist in the war. 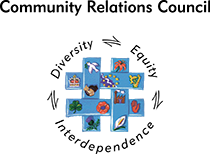 Joseph Devlin led the nationalist recruitment drive in the North. Redmond believed that by supporting the British army, he was ensuring the survival of Home Rule. However some sections of the nationalist community saw Redmond's speeches as a betrayal. This division caused a split in the Irish Volunteers. Around 11,000 volunteers broke away from Redmond, to be led by Eoin MacNeill. However the majority, around 170,000 men supported Redmond and were renamed the National Volunteers. 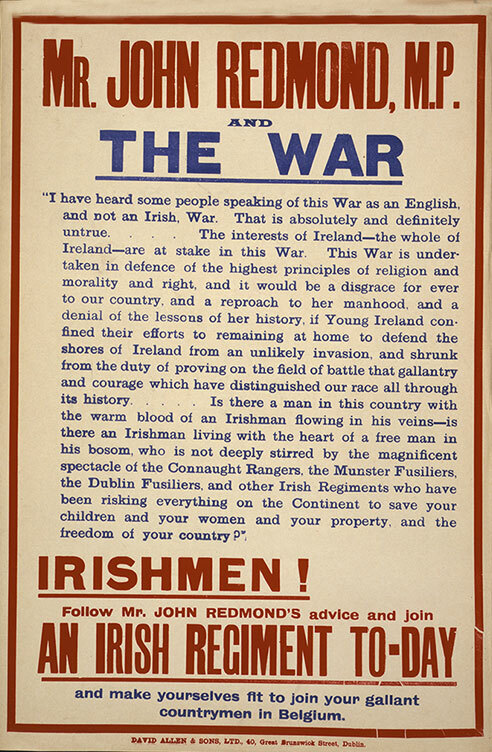 A recruitment poster for WW1: John Redmond MP urging Irish men to join the war effort.